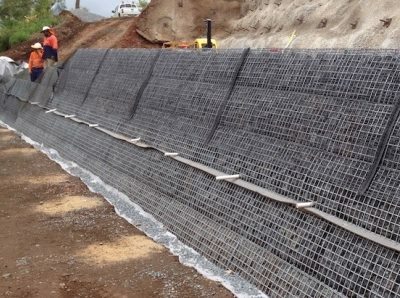 Reinforced soil walls (also called mechanically stabilised earth walls) are becoming increasingly popular as an economical and effective solution of earth retention. With a Global Synthetics Reinforced Soil System, each component is carefully selected and engineered to work together to provide a structurally sound long term solution. This TERRALINK® System is for slopes up to 45º, utilising primary structural geogrids for internal stability of the slope. It also incorporates a permanent Turf Reinforcement Mat (TRM) laid over the slope surface to prevent erosion and promote vegetative growth. No rigid facing or TERRALINK® steel facing panels are required for this option. The TERRALINK® System is a proven engineered solution for slopes up to 70° which require a vegetated facing. Consisting of an ACEGrid® geogrid wrapped face with biodegradable bags forming the face angle, TERRALINK® is cost effective and fast to build. The TERRALINK® System is a proven engineered reinforced soil system with a steel mesh facing for walls up to near vertical inclination. The facing can either be vegetated or filled with stone for a gabion type appearance.